The Mormon Church, or the Church of Jesus Christ of Latter-day Saints, was founded by Joseph Smith in New York in 1830 and based on his doctrinal teachings. Jedediah M. Grant introduced the Mormon Church to North Carolina in May 1838 as the first missionary to enter the state. Traveling alone, he preached in Surry, Stokes, Patrick, and Rockingham Counties, baptizing four people. Shortly after June 1838, two other Mormon leaders joined Grant. In addition to baptizing eight more people, Francis Gladden Bishop published a pamphlet for the purpose of correcting the misrepresentations that had, in his view, prejudiced the public against the Latter-day Saints. 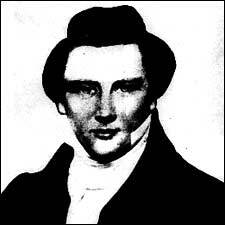 In late 1839, Joshua Grant Jr. joined his brother Jedediah, further expanding the missionary effort in North Carolina. Although the Mormon missionaries concentrated their efforts mostly in northwestern North Carolina, the church was also introduced to other sections of the state. A letter written by John Eldridge dated 2 Jan. 1844 reveals that he "traveled through NC to Raleigh (Wake County)," where members of the legislature invited him, as their guest, into their respective boardinghouses. From Raleigh, Eldridge traveled to Fayetteville, then on to Wilmington. On the coast he "baptized some in the sea" before heading for the North Carolina mountains, where he found "some saints raised up by Jedediah M. Grant." He started holding meetings with them. After Latter-day Saints leader Joseph Smith was killed at a Carthage, Ill., jail on 24 June 1844, most missionary activity in the church was curtailed; however, R. H. Kinnamon, Joshua Grant, Henry G. Boyle, and others continued their proselytizing in North Carolina and Virginia. In October 1875, the Southern States Mission was officially organized. It included North Carolina and 12 other states. After a 1928 division, North Carolina became part of the newly created East Central States Mission. A list of Mormon Church members baptized in North Carolina between 1868 and 1895 reveals that 28 percent of them moved westward out of the state. On 29 Oct. 1887 the western counties of North Carolina were transferred to the East Tennessee Conference, decreasing the number of traveling missionaries in the North Carolina Conference from 19 at the end of August 1887 to 8 by August 1888. By 1891, from the total of 195 North Carolina Mormon Church members, 35 had emigrated west, 17 had died, and 15 had been excommunicated, leaving 128 members in the North Carolina Conference in 1894. Later, newly converted members were encouraged by church leaders to stay in the state and build branches; however, according to the year-end report dated 24 Dec. 1893, there was only one branch of the church in the North Carolina Conference. The Southern States Mission was only one of 19 missionary fields in the Mormon Church at the close of the nineteenth century. At that time, almost all the missionaries came from the main body of Mormons in the intermountain West. They depended on their fellow Mormons for the support of their families; they also depended on daily North Carolina contacts for food and lodging. Some Mormon doctrines, particularly the practice of polygamy, raised alarm among many North Carolinians and made the work of Mormon missionaries difficult. Even though the church submitted to the U.S. law against polygamy passed in 1890, the notoriety associated with the practice plagued Mormons for years to come. The Mormon Church experienced exponential growth in North Carolina in the twentieth century. Primarily college-aged men and women have converted many thousands of the state's residents. In the early twenty-first century, North Carolina Mormons numbered more than 53,000, and two missions existed in the state. Wallace R. Draughon, History of the Church of Jesus Christ of LDS in North Carolina (1992). W. W. Hatch, There Is No Law: A History of Mormon Civil Relations in the Southern States, 1865-1905 (1968). Joseph Smith, History of the Church of Jesus Christ of Latter-day Saints (1948). Joseph Smith. Image courtesy of PBS. Available from http://www.pbs.org/weta/thewest/people/s_z/smith.htm (accessed June 5, 2012). 1 January 2006 | Boudreaux, Joan S.